Why it matters: The laws — governing everything from from privacy to copyright to content filtering — stem from concerns about the behavior of big platforms, like YouTube and Facebook. But big companies have more resources to comply with complicated regulations than small firms. The latest: The European Parliament last week passed a directive that would overhaul its copyright law and would force platforms to impose strict filters for copyright violations or face fines. Regulatory analysts argue that the law seems manageable for Google and Facebook, while some activists say it would crush smaller firms. Paul Gallant, regulatory analyst at Cowen and Company, argues in a note to clients that the biggest feature of the new law wouldn't break big tech's back. In the case of one of the law's key provisions, he said, "damages are the actual lost revenues to the content owner ... not multi-billion dollar-style antitrust fines." Evan Engstrom, executive director of startup advocacy group Engine, says that the proposal is "an existential threat" for a lot of smaller companies. "Not only does it cement the power of big platforms, but it's also really problematic from a creativity perspective," he said. What's happening: The EU has has zeroed in on policing content and privacy. 1) The copyright law, which is meant to give content creators more money for their intellectual property, is being backed by many famous artists and recording trade groups. But opponents worry that compliance will be difficult. For media geeks, the new law would force big web platforms that aggregate content to actually pay publishers for linking to their stories, in what's being dubbed a "link tax." It would also make them obtain licenses for using copyrighted material, which inevitably shift some power back into the hands of creators. 2) A new content filtering law is simultaneously being proposed by the EU, which would fine internet platforms if they fail to remove terrorist content within an hour of it being posted. Like the copyright law, critics argue that small firms will struggle to comply with this type of regulation without engaging in some sort of content censorship up front. 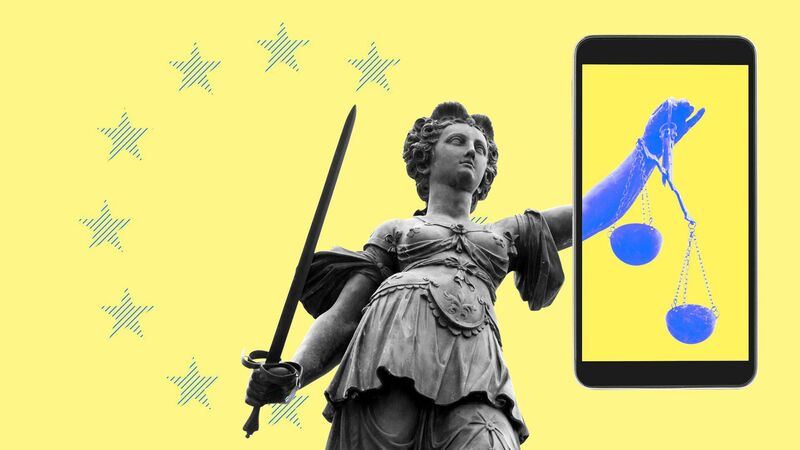 3) A sweeping data privacy law that went into effect in the EU in May called the GDPR (General Data Protection Regulation), presents similar concerns. From the outset, it became clear that the law could inadvertently cement the dominance of bigger tech platforms that could afford compliance over smaller ones. Early reports suggest that smaller firms are frustrated with enforcement. To date, over 1,000 U.S. websites are still not available in Europe. Yes, but: Even though large companies can in many cases deal with the new restrictions, authorities in Brussels and elsewhere in Europe have the giant platforms in their sights. EU competition commissioner Margrethe Vestager has leveled two massive fines against Google, and still has an open probe of the company. The EU has also pursued Apple over what it says are taxes owed to Ireland. German authorities are expected to move forward in an antitrust case against Facebook. Still, these cases move slowly, including appeals and long investigations. The big question is whether EU-initiated regulations will be somehow copied in the U.S. Even though the EU has taken the lead in regulating the platforms, most analysts agree that some of its proposals would be hard to implement in the U.S. because they are at odds with America's culture of free speech and free markets and — at least in the current political environment — less appetite for big government regulations.